Custom Crystals Jewelry Handmade for Valentine Jewelry or any occasion with Swarovski Lite Sapphire Crystals Heart Pendant & Beads accented in Sling Rhodium Wire are the perfect for your outfit wear & appropriate for the party or to gift to your love one on the very special occasion. 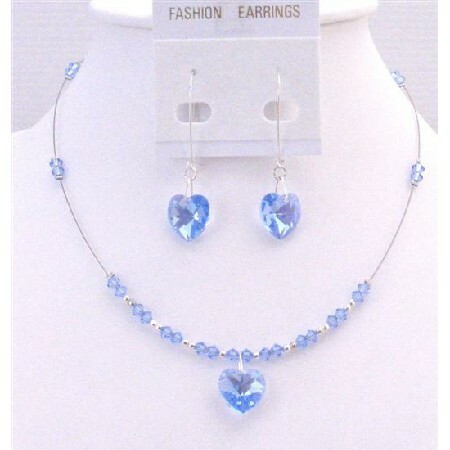 Sparkling Lite Sapphire Crystals Heart Pendant & Earrings are very beautiful & gorgeous. Handmade Exquisite Necklace All A Grade & Swarovski Crystals Material are used to make this beautiful Necklace Set.